Travel rewards credit cards fall into several broad categories. First, airline rewards credit cards are designed to reward spending with specific airlines or airline partnerships. When purchasing airfare, in-flight incidentals, and possibly other travel-related items, cardholders earn points at accelerated rates. Once enough points are racked up, they can be redeemed for free or discounted flights, free or reduced baggage fees, and other goodies. Some airline rewards cards offer additional perks and benefits, such as airport lounge access, discounts with hotel partners, and bonus miles for reaching certain travel milestones. Hotel credit cards focus their rewards firepower on hotel stays and related expenses. Many major hotel brands and brand families offer at least a handful of credit cards that reward cardholders for room, food, and incidental purchases (such as spa treatments) at properties they own. Many hotel rewards credit cards also accumulate points for everyday outlays, such as regular restaurant meals, gasoline, and supermarket purchases. Cardholders can redeem their points for free or discounted nights and other hotel expenses. Lately, growing numbers of cash back credit cards have jumped into the travel rewards game. General-purpose cards often offer accelerated cash back earnings on gasoline, airfare, and restaurant purchases – all critical, and sometimes costly, expenses for frequent travelers. Cash back rewards can be redeemed for merchandise and gift cards purchased online, airfare and hotel stays purchased directly through providers, and actual cash or statement credits. If you’re a frequent traveler, you likely stand to benefit from all of these card types. And if you own your own business, you can count on many consumer travel credit cards having small business credit card counterparts – often with additional features and benefits for small business owners. Whether you’re an individual or business customer, many come with attractive promotions and sign-up bonuses or welcome offers that can be hard for deal-seeking applicants to resist. Incidentally, we outline some of the best small business travel cards toward the bottom of this list. Here’s a look at today’s best travel rewards credit cards. 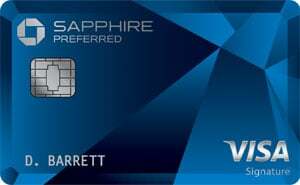 The Chase Sapphire Preferred® Card is one of the most popular travel rewards credit cards around, and for good reason. It earns an unlimited 2 Ultimate Rewards points per $1 spent on dining and travel purchases, plus 1 point per $1 on all other purchases. Like Sapphire Reserve, you can transfer Ultimate Rewards points earned with Sapphire Preferred to participating travel loyalty programs at a coveted one-to-one ratio. Ultimate Rewards points are worth up to $0.0125 apiece when redeemed for travel purchases (such as airfare, hotels, cruises, and car rentals) through the Ultimate Rewards portal – a 25% boost to their cash redemption value. Points are worth $0.01 or less when redeemed for non-travel purchases and cash equivalents, such as gift cards, statement credits, direct deposits, checks, and physical merchandise. Oh, and don’t miss Chase Sapphire Preferred Card’s awesome solid sign-up bonus. When you spend at least $4,000 in eligible purchases in 3 months, you get 60,000 bonus Ultimate Rewards points. Sign-up Bonus: You get 60,000 bonus Ultimate Rewards points, which can be worth as much as $750 when used to purchase airfare and hotels through Ultimate Rewards, when you spend at least $4,000 in eligible purchases within 3 months. Rewards Rate: Earn unlimited 2 points per $1 spent on qualifying dining and travel purchases, and unlimited 1 point per $1 in all other eligible purchases. Redemption: Redeem for travel purchases made through Chase’s Ultimate Rewards portal at a $0.0125-per-point value. Or redeem for cash, gift cards, checks, and other items, at a per-point value of $0.01 or less. Important Fees: The annual fee is $95. There’s no foreign transaction fee. Balance transfers cost the greater of $5 or 5%, and cash advances cost the greater of 5% or $10. Other Perks: You get VIP treatment and exclusive deals for select entertainment and sporting events, including the PGA Championship. 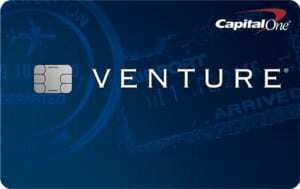 Like Discover it Miles and BankAmericard Travel Rewards, Venture Rewards allows you to redeem points for statement credits on a wide range of travel purchases, including flights, rental cars, hotels, vacation packages, cruises, and incidental expenses. You can also redeem for general statement credits or paper checks. This card has a very good early spend bonus: 50,000 bonus miles when you spend at least $3,000 in purchases in the first 3 months. That’s worth up to $500. Just be aware that the annual fee is $95 (waived in the first year). Early Spend Bonus: Earn 50,000 bonus miles, worth $500 in travel expenses, when you spend at least $3,000 in eligible purchases during the first 3 months of card membership. Rewards Rate: Earn unlimited 2 miles per $1 spent on all eligible purchases. Through January 2020, earn unlimited 10 miles per $1 spent on eligible purchases at hotels.com/venture. Redemption: Redeem for statement credits against virtually any type of travel purchase, or non-travel items such as statement credits and paper checks. Points are worth $0.01 apiece when redeemed for travel. Important Fees: There is a $95 annual fee after the first year. There’s no balance transfer fee or foreign transaction fee. Cash advances cost the greater of $10 or 3%. Other Perks: Capital One offers free and unlimited credit score access through the CreditWise feature. 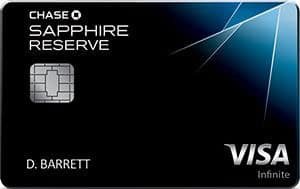 Chase Sapphire Reserve is an exclusive card designed for frequent travelers who enjoy flying and staying in style. If you can earn rewards quickly enough to offset the $450 annual fee, this is one of the best travel cards you can carry in your wallet – period. Highlights include a generous sign-up bonus worth up to $750 when redeemed for travel, a $300 annual travel credit, access to more than 1,000 airport lounges worldwide with a complimentary Priority Pass Select membership, and a one-to-one point transfer program that boasts some of the world’s top travel vendors, including Southwest Airlines and the Intercontinental Hotel Group. When you transfer Ultimate Rewards points earned with your Sapphire Reserve card to participating loyalty programs, you get an equivalent number of points – 1,000 Ultimate Rewards points becomes 1,000 Southwest Rapid Rewards points, and so on. Everyday spending pays off with Sapphire Reserve too. This card earns an unlimited 3 Ultimate Rewards points per $1 spent on dining and travel purchases. All other eligible purchases earn unlimited 1 point per $1 spent. Ultimate Rewards points are worth up to $0.015 apiece when redeemed for travel purchases (with no blackout dates or seat restrictions) through the Ultimate Rewards portal. Other redemption methods, such as statement credits and gift cards, are worth $0.01 per point or less. Sign-up Bonus: When you spend at least $4,000 in qualifying purchases within 3 months, you earn 50,000 bonus Ultimate Rewards points. That’s worth up to $750 when redeemed for airfare, hotels, and other travel purchases through the Ultimate Rewards portal. Rewards Rate: Earn unlimited 3 points per $1 spent on qualifying dining and travel purchases. All other qualifying purchases earn unlimited 1 point per $1 spent. Redemption: Points are most valuable ($0.015 per point) when they’re redeemed for travel purchases at the Ultimate Rewards portal. That’s a 50% boost to the standard cash redemption value. You can also redeem for statement credits, bank account deposits, gift cards, merchandise, and other items, at a per-point value of $0.01 or less. Important Fees: The annual fee is $450. Additional cards for authorized users cost $75 per card, per year. There’s no foreign transaction fee. Balance transfers cost the greater of $5 or 5%. Cash advances cost the greater of 5% or $10. Other Perks: $300 annual travel credit against qualifying travel purchases (including airfare and hotel stays); 1-to-1 point transfer privileges with popular travel vendors; complimentary Priority Pass Select membership, which confers access to more than $1,000 airport lounges worldwide; Global Entry or TSA Precheck application fee credits, up to $100 value every four years. 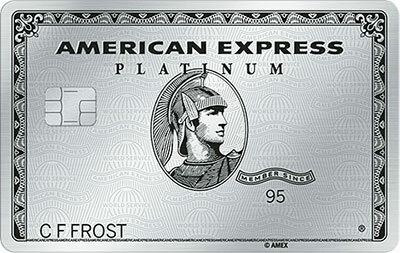 The Platinum Card’s rewards scheme is almost beside the point. Yes, eligible airfare purchases made directly with the airline and airfare and prepaid hotel purchases made through the American Express Travel portal earn unlimited 5 Membership Rewards points per $1 spent, and all other purchases earn unlimited 1 Membership Rewards point per $1 spent. But that’s just the tip of the iceberg. Stays at Fine Hotels & Resorts Collection properties include up to $550 (on average) in exclusive benefits, such as room upgrades and complimentary breakfast. The list goes on. (We haven’t even gotten to the generous welcome offer yet.) If you’re in the market for a truly distinctive card and you’re confident you can get your money’s worth out of this card, it’s worth a closer look. Just remember that The Platinum Card is a charge card, so you need to pay your balances off in full each month or risk account closure. Sign-up Bonus: Earn 60,000 bonus Membership Rewards points when you spend at least $5,000 within 3 months of opening your account. Rewards Rate: You’ll earn 5 Membership Rewards points for every $1 spent on eligible travel purchases, including flights booked directly with airlines, flights booked through American Express Travel, and prepaid hotels booked through American Express Travel. Redemption: You can redeem your Memembership Rewards points for virtually anything, including travel with dozens of global brands, merchandise, gift cards and cash equivalents, services, experiences, and more. Important Fees: The annual fee is $550, but there’s no authorized user fee or foreign transaction fee. Late and returned payments cost up to $38. Other Perks: This card has a staggering range of benefits. Highlights include $200 airline fee credit with the airline of your choice, up to $200 in Uber credits annually, complimentary access to more than 1,100 airport lounges worldwide, Global Entry or TSA PreCheck fee waiver, up to $550 in average benefits and inclusions at participating Luxury Hotels & Resorts Collection properties, automatic and complimentary Gold status with the Hilton Honors loyalty program, and more. The Citi Premier? Card is one of the few travel rewards credit cards that includes gas and gas station purchases in its travel tier, which earns unlimited 3 points per $1 spent on qualifying travel purchases. If you do most of your long-haul travel by car, or you have a long commute that can feel like a road trip some days, this is a valuable inclusion that could greatly boost your net rewards. Premier also has a great sign-up bonus worth up to $750 when redeemed for airfare purchases, along with an unlimited 2x tier that rewards restaurant and entertainment spending. Plus, Premier’s points transfer scheme mostly matches Chase Sapphire Preferred’s, with 1-to-1 transfer ratios for most partner pairs. Don’t sleep on the transfer arrangement’s value, either: some partner points or miles can be worth several times the $0.01-per-point ThankYou baseline when redeemed for long-haul travel in higher fare classes. Sign-up Bonus: Earn 50,000 bonus ThankYou points after making $4,000 in purchases with your card within the first 3 months your account is open. That’s worth up to $625 when redeemed for airfare booked with any airline through the ThankYou travel portal. Rewards Rate: Earn unlimited 3 points per $1 spent on all eligible travel purchases, including purchases made at gas stations. Earn unlimited 2 points per $1 spent on eligible dining and entertainment purchases. All other eligible purchases earn unlimited 1 point per $1 spent. Once earned, points don’t expire as long as your account remains open and in good standing. Redemption: The best way to redeem your accumulated ThankYou points is for airfare purchases made through the ThankYou travel rewards portal. You can book flights on most major airlines here with no blackout dates. When redeemed for airfare booked through the ThankYou portal, ThankYou points are worth 25% more than their standard $0.01-per-point redemption rate – for instance, a 60,000-point redemption is worth $750 in airfare. Other redemption options include gift cards, general merchandise, and statement credits, and experiences. Redemption values vary, but generally come in at $0.01 per point or less. Important Fees: There is a $95 annual fee after the first year. There is no foreign transaction fee. Balance transfers cost the greater of $5 or 3%. Cash advances cost the greater of $10 or 5%. Other Perks: If you don’t want to redeem for travel or other items in the ThankYou portal, you can transfer your points to more than a dozen partner travel loyalty programs. Most are associated with major international airlines. With exceptions, the transfer ratio is 1 ThankYou point to 1 partner point or mile – a favorable ratio on par with other top travel rewards cards. Partners include JetBlue, Virgin Atlantic, and Turkish Airlines. Another choice benefit is Citi® Private Pass®, which entitles you to exclusive and VIP event access at some of the biggest tickets in town. The Barclaycard Arrival® Plus World Elite Mastercard® earns unlimited 2 miles per $1 spent on all eligible purchases. There’s a generous sign-up bonus too: 70,000 bonus miles when you spend at least $5,000 in eligible purchases within 90 days. The 5% redemption bonus lessens the sting of the 10,000-mile redemption minimum. And there’s no foreign transaction fee – great news for globe-trotters looking to save money on international travel. The $89 annual fee (waived in the first year) does demand a modicum of annual spending, though. The most productive redemption option is statement credits against recent travel purchases – you can redeem for virtually any type of travel, with no blackout dates or other restrictions. Other options include gift cards, cash back, and merchandise, but they all value miles lower than the standard $0.01-per-mile rate. Sign-up Bonus: Earn 70,000 bonus miles when you spend at least $5,000 in eligible purchases within 90 days of opening your account. Rewards Rate: Earn unlimited 2 miles per $1 spent on all eligible net purchases, with no caps or restrictions. Redemption: The optimal redemption option is travel: specifically, statement credits against prior travel purchases. Virtually all travel purchases are eligible, including hotels, car rentals, flights, vacation packages, and cruises. There are no blackout dates, seat restrictions, or other limitations on redemptions. Miles are always worth $0.01 apiece when redeemed for travel, subject to a minimum redemption of 10,000 miles ($100 credit value). Between $100 and $2,000 in redemption value, redemptions are permitted in increments of $25 between $100. Every travel redemption triggers a 5% bonus – for instance, 500 bonus miles when you redeem 10,000 miles. The bonus is deposited into your account for use toward your next redemption. Other redemption options, including cash back, gift cards, and merchandise, value miles at significantly less than $0.01 apiece. Important Fees: There’s a $89 annual fee after the first year. There is no foreign transaction fee on international spending. Balance transfers cost the greater of $5 or 3%. Cash advances cost the greater of $10 or 5%. See terms and conditions for more information.